Have fun and make money with this 2 bedroom, 2 bath condo located in the popular Bahia Azul ocean front community. This ground floor unit is being sold fully furnished and turnkey. Ideal for the investor wanting an income producing condo in Jaco Beach. 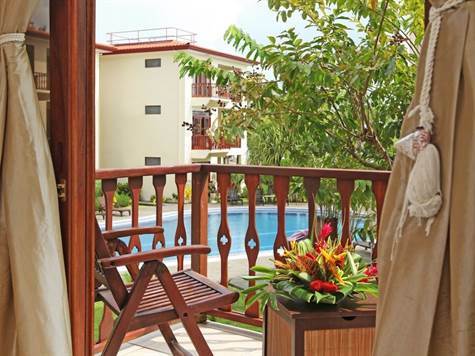 This unit is just steps to the swimming pool and sand beach. Perfect for the absentee owner that wants to enjoy time at the beach, and walk to the many restaurants, nightlife and amenities of Jaco. Established property management and vacation rental business available for the new owner desiring good ROI and carefree ownership.